President Donald Trump has said that he is seriously considering naming US State Department spokeswoman Heather Nauert to succeed Nikki Haley as US ambassador to the United Nations, adding that he would make a decision on the posting soon. ABC News reported on Thursday that Nauert was offered the job, citing an unnamed senior White House official. Fox News Channel also reported Nauert had been asked to take it on. Trump, though, cast her only as a top choice, saying “we have a lot of people that want the job. And there are a lot of really great people”. Asked by Reuters whether Nauert had been offered the job, a White House official said only that she is under consideration. A source familiar with the selection process said earlier on Thursday that Nauert was “at the top of the list”. Nauert’s deputy, Robert Palladino, was also asked at a news briefing whether she had been offered the job, and said that any announcement would be the prerogative of the White House. Nauert, a former anchor and correspondent at Fox News Channel, joined the State Department as spokeswoman in April 2017. She was named acting undersecretary for public diplomacy [JB emphasis] and public affairs earlier this year. 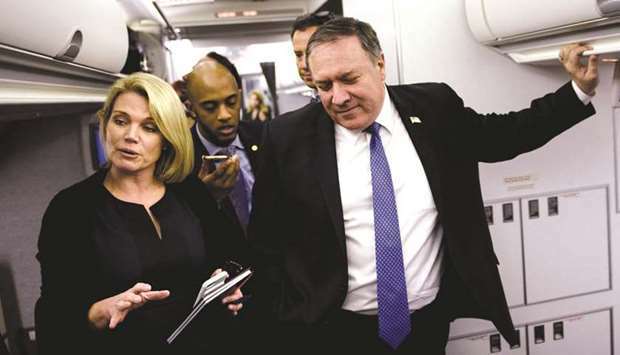 ... after the firing of then-Secretary of State Rex Tillerson, Nauert was named acting Under Secretary of State for Public Diplomacy and Public Affairs.